Why Buy a Lear 45? Fly at 45,000ft, above the weather at 435+ knots for up to 1,800nm with available seating for eight (8) passengers. Full Engine Coverage, Wifi Equipped, Great Mx Status. ​board, each passenger seat equipped with 110v outlets and no major maintenance coming due soon. Enclosed Lavatory, Wifi Internet, 110V Outlets at each seat. 852K's interior in very good condition and features seating for eight (8) passengers in a dual club configuration. 110v outlets at each seat, GoGo Wifi, and Airshow 400 provide in-fight entertainment and connectivity. The medium dark brown wood grain with taupe leather seating and lower sidewalls provide a good balance between seats that are easy to keep clean while still having a warm, inviting interior. Not yet ready to be re-painted, unless of course you want to. The interior is in very good condition and features seating for eight (8) passengers in a dual clubconfiguration. 110v outlets at each seat, GoGo Wifi, and Airshow 400 provide in-fight entertainment and connectivity. The medium dark brown wood grain with taupe leather seating and lower sidewalls provide a good balance between seats that are easy to keep clean while still having a warm, inviting interior. 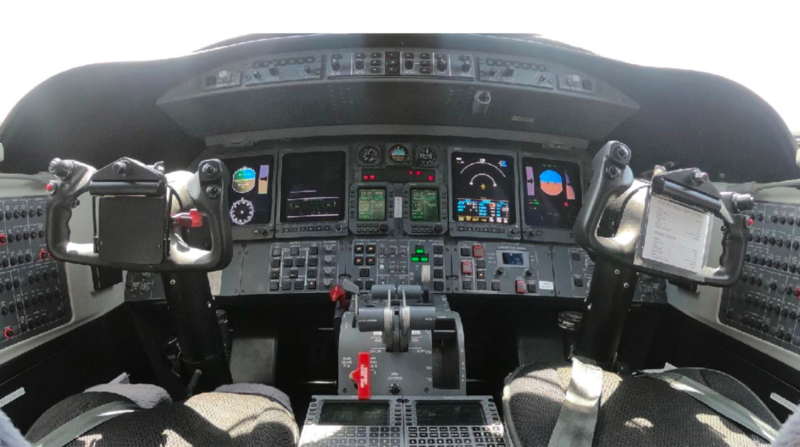 The plane is professionally flown by an owner-employed, three man crew and maintained, operated and flown to Part 135 standards on Delta Private Jets certificate. No known damage history and always hangared. All maintenance performed by independent, third-parties.